Yamaha XSR900: neo retro style, powerful engine, energy-intensive suspension, high riding position, traction control. Technically, this bike can be anything - comfortable urban, sporty, aggressive, extreme, fast. The riding position on the motorcycle is upright, therefore it limits the capabilities of a motorcycle, for example, it’s uncomfortable to drive faster than 130 kmh, it’s not very convenient to steer actively at high speed. With the help of adjustable footrests, you can adjust the position of the legs and the inclination of the body, respectively. The main problem with the installation of new footrests is that they are mounted on the pendulum axis, so you need to lift the motorcycle by its frame. The XSR900 is based on the MT-09, but there is no central stand on the XSR in the MT model. You can lift a motorcycle with the help of jacks (as we did in the video), by its tail, if there is a hook, or you can set a non-original central lift. The adjustable footpegs LSL 2-Slide are supplied with assembled and lubricated lever mechanisms, the remaining parts must be installed by yourselves. It is very important to set all the screws, that are not fixed with nuts, on the thread retainer, otherwise they can get out while driving. Do not use the strongest retainer, because then it will be difficult to disassemble the pegs when you need it. 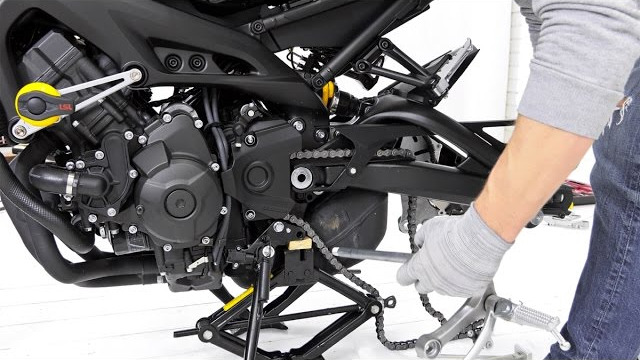 Installing the pegs on the XSR900 is a complicated, so we hope our video will be useful for everyone who is ready to do it!